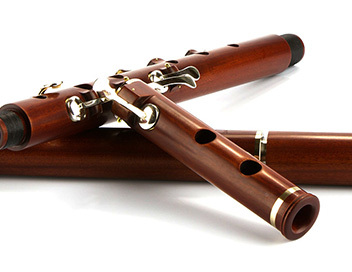 The Windward Pratten is available in D or Eb, and can be ordered as a keyed or keyless flute, as can the patented Windward Combo which is an Eb/D convertible pitch flute. All share the same bore. We arrived at the measurements for the Windward Pratten centre-joint by studying a number of instruments, among them were Hawkes Prattens and Boosey Prattens, flutes that were typical of the English taper bore flutes circa 1860. To the modern ear those flutes display a few common problems in that the A is often sharp, the F# is flat, the E is weak, and several have been tuned to "English High Pitch" with A as high as 456Hz. We were keen to make improvements where possible. In developing the Windward version of the Pratten flute, our goals were to retain the best qualities of the original instruments, to set the pitch at 440, to eliminate tuning irregularities, and to improve the octave balance. If we are to believe the feedback from our players, we have achieved what we set out to do. Our head-joints are unlined to show-off the inherent resonance in the tone wood, and the tuning-slides are made of Cupro-Nickel, which is a more durable metal than silver. We designed four main embouchure cuts to suit different playing styles. Each one is easy to sound though it can take a lot of air, and each one enables rapid articulation. This allows the player to achieve a wide dynamic range with a broad tone palette and to stretch his or her potential. The embouchure can be custom cut if the player attends the ceremony! We believe that a well formed embouchure is to the flute, what a good bow is to the violin. It allows the player to pull from the instrument what it is capable of giving. The Windward Pratten is an accessible instrument for the beginner and still rewards the advanced player.